Looking to up your boss-slaying prowess? Want to pit yourself against some of the biggest evils known to Nuanor? Then look no further than the Windswept Gauntlet, a place where players can improve their mechanical skills during boss fights by fighting them over and over in epic one versus one showoffs. Select a class, pick a boss and steel yourself – they will have all their usual skills and, depending on which boss is being faced, additional skills as well. You’ll need solid nerves, consistent DPS and the ability to react to their every move if you wish to succeed with maximum points (1200; 600 defense + 600 offense). You’ll be provided with normalized gear and stats (avg. 72,000 gearscore) no matter which class you pick, so everything boils down to you and your skill alone. Initially, you’ll only be able to select one of 9 bosses. In order to unlock the last boss, Scarlet Wyrma, you’ll need to defeat all previous bosses with every class. Scarlet Wyrma will provide a thrilling challenge that is unlike the previous 9 warmup bosses, so don’t get too comfortable. Leading up to that point, the 9 bosses will have mostly the same mechanics as their Expert Mode counterparts, providing training up to level 55 expert raids. Players can choose a Practice Mode that involves battling a dummy in order to get used to their chosen class and its combos – a chance to learn their skill effects before taking on the real challenge. Promising rewards await weekly players, such as Special Skill Pages, as they defeat 2, 5, 10, 20, 30, 40 or 50 bosses. If you’re truly dedicated and earn a perfect score with every class vs every boss, you’ll receive the Skyfire Dragon Wings for a limited time. These special wings have their duration increased by continuing their rampage and slaying another 50 bosses a week. The challenge is set and the gauntlet is ready. All that remains is to prove yourself a worthy champion of the Windswept Gauntlet. 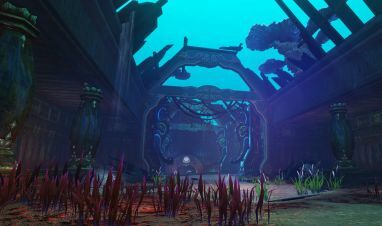 Scour your way through the dank depths of this seaweed laden lair – the Sunken Galleon! 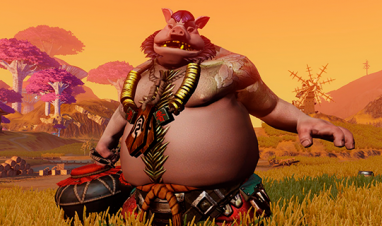 Beware – pig on the prowl, spitting bile and wine at adventurers from up to 40 meters away. Could it be one of the three Demon Kings?